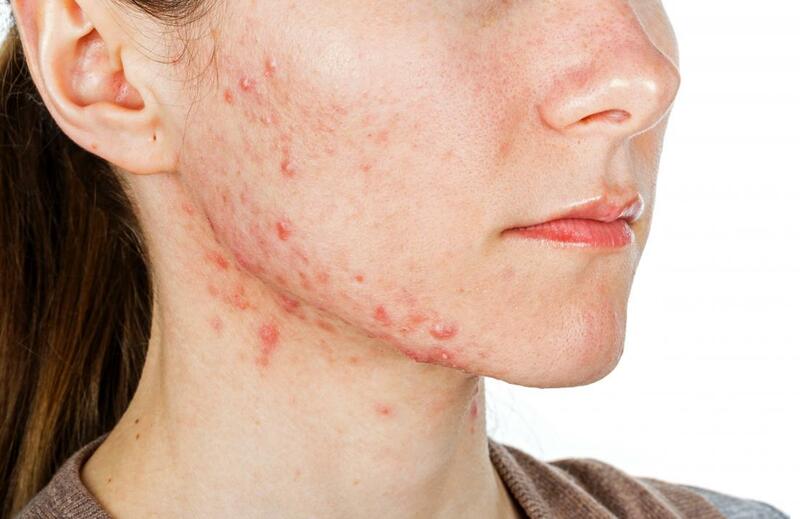 Acne is a skin condition which affects the sebaceous glands or hair follicles in the skin. Sebum or oil produced by the sebaceous glands keep the skin lubricated and protected. But, like most things, too much of a good thing can be problematic. When the follicles become clogged with oil and dead skin cells (causing “blackheads” or “comedones”), bacteria in the hair follicle become activated and cause inflammation in the form of red pimples, pustules or even painful cysts. Although many people may argue that acne is “physiological” during adolescence since 85% of teenagers have some form of acne, it can nevertheless be distressing and impact self-esteem and confidence. In addition, we are seeing a surge of adult-onset acne in both men and women. Thankfully, there are numerous treatments available no matter the severity of the condition. Time will be spent carefully going through past and current skincare regimens and cosmetic use as well as medication and supplements ingested. In many cases, contributing factors will be uncovered. Only then will our experienced team of dermatologists help to determine the right treatment whether you prefer conservative or more aggressive treatment to help prevent scarring. The treatment plan will be a holistic and realistic one and will be formulated around optimizing the gut microbiome, topical therapies, oral medications or even focus on in-house treatments such as peels or laser therapies. We also offer multiple treatment modalities aimed at treating existing acne scars. Simply put, we have a zero tolerance attitude towards acne – there really is no need to suffer through it. Myths about acne are as common as the skin problem. One common myth is that you have to let acne run its course. Respectfully we disagree. Not only will we formulate a personalized treatment plan for flares, we also emphasise the need to continue treatment once the skin has cleared to prevent any further breakouts. If at any stage, the skin becomes red, irritated or flaky, this is not an allergic reaction, but rather a case of too much too quickly. You should stop all creams and initiate intensive moisturizing and then restart using them more infrequently once the skin has calmed down.